And even though my husband is off tomorrow, it’s not his fault. So these are gluten-free! Don’t worry, you’ll never know. 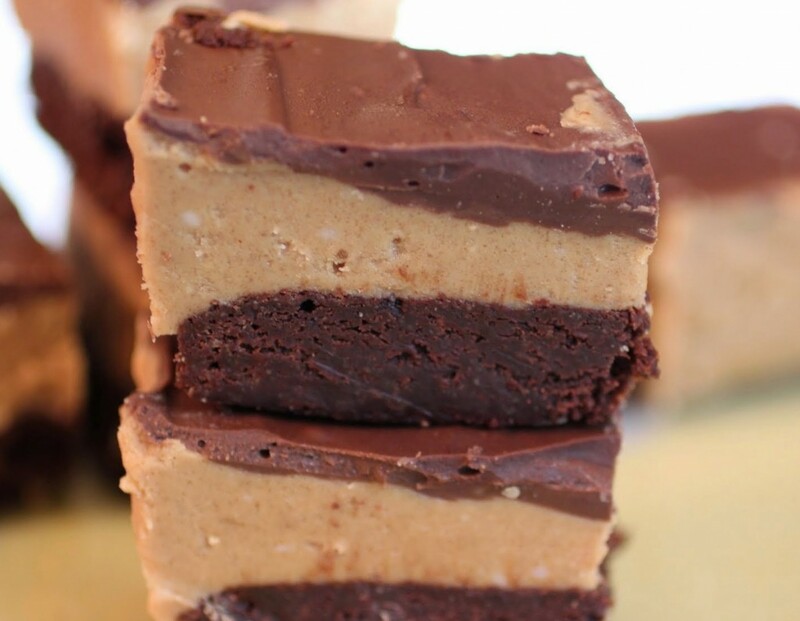 I made a much less crazy version of these a few months back, so if you’re into something simpler, try my GF peanut butter bars. 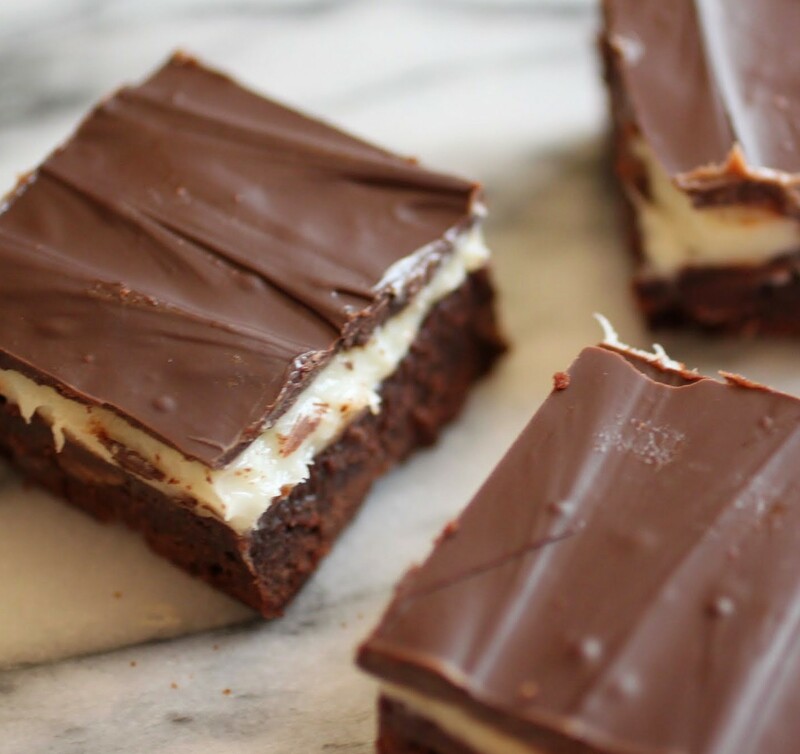 But if you’re like me and enjoy taking things up a notch, add a layer of amazing brownie underneath! Yep, that’s the setup. A layer of brownie, made with oat flour. A layer of peanut butter filling which, I swear to all the powers above, tastes like a peanut butter cup, but better. And then, a nice thick layer of milk chocolate. Instead of testing this out with my husband, I actually brought this to a friend’s house. She has to eat a GF diet, and I was thrilled that not only did she eat hers up, but so did everyone there. And most of those people eat gluten. So I guess they couldn’t tell! If you’re having a bad Sunday night or just need that everlasting PB/chocolate fix, step right up! The antidote for any blah moment is right here! Preheat the oven to 350. Line an 8 X 8 pan with foil and spray it with cooking spray. Set aside. Spread the batter in the prepared pan. Bake for 25-30 minutes until the top is set. 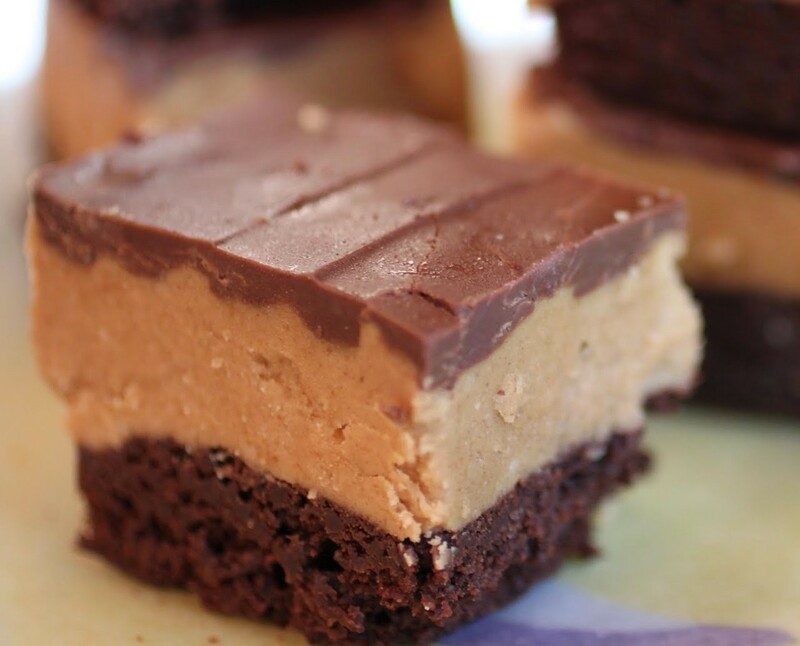 While the brownies are baking, make the peanut butter filling. On the stovetop, melt the butter over low heat. Add the brown sugar, peanut butter, powdered sugar, vanilla and salt. Stir until the mixture is combined and smooth. 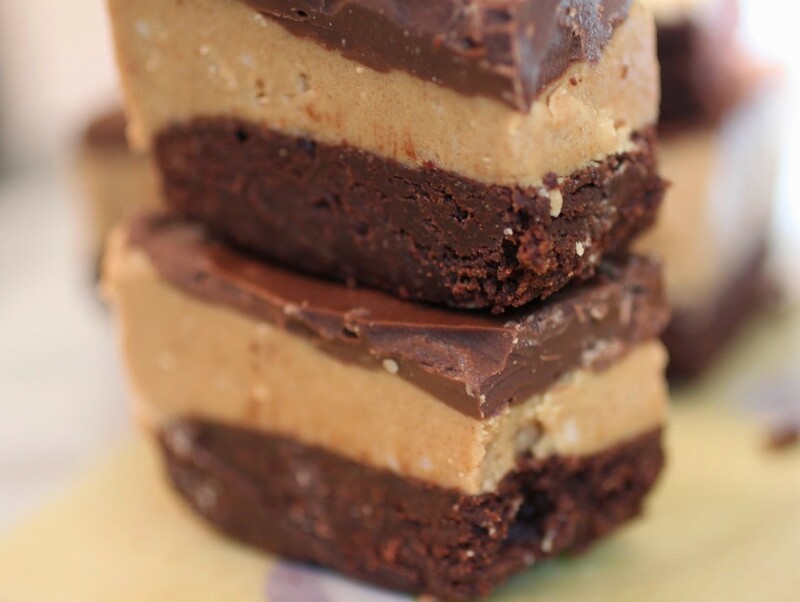 Press the peanut butter mixture lightly on top of the brownies, doing your best to make an even layer. Sprinkle the chocolate chips on top and wait five minutes. Using a spatula, spread the melted chocolate over the peanut butter layer. Chill for about 30 minutes until the chocolate is set. 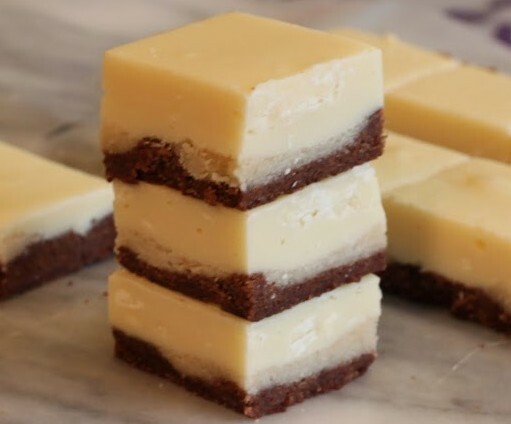 Let the bars come to room temperature and cut into small squares. Help! There’s a chocolate shortage! I’m not kidding, you guys. I just saw this article and I’m freaking out! I don’t want this to happen. How can we stop this from happening? Now I feel really awful about using so much chocolate all the time. This is my fault! And this post isn’t helping, either. I swear I made these before I learned about the shortage. But I can see that really, using three times the amount of chocolate that I need to in a recipe might be going too far. But isn’t that what makes baking fun? I warned you this was coming. The mashup of all mashups. The moment in my baking career all will look back upon and point to as that one, special instant when everything came together. Or maybe it’s just a nice post for a nice day. Boys, this one’s for you. You like beer. You like donuts. And your feminine counterparts are pretty wild for brownies and anything with maple syrup. 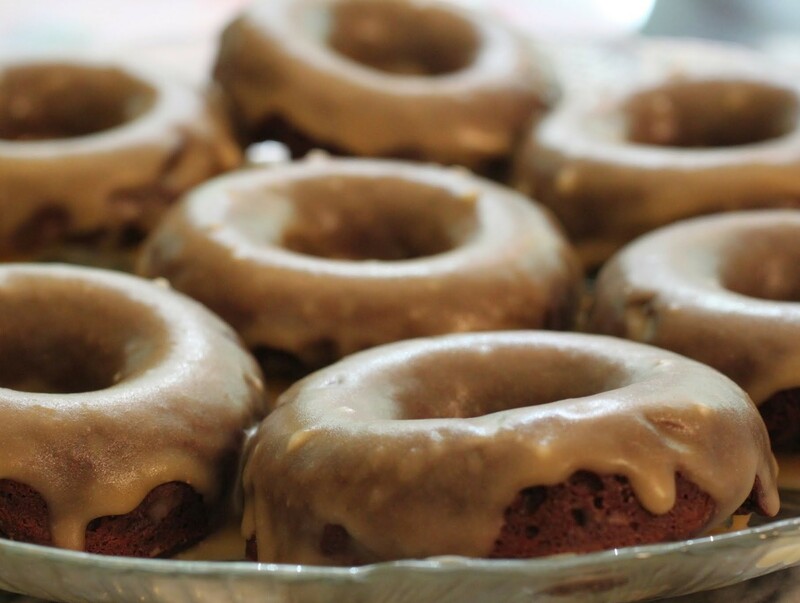 Actually, we like beer and donuts, too. Why gender stereotype? I don’t have today off work either, so I’m super jealous of everyone that does. But peanut butter and chocolate definitely help to make things better! I love that you used oat flour in these brownies, too. I will have to try that! Such a great Monday treat, Mir! Thanks, Gayle! Oat flour doesn’t work in everything, but in brownies it actually does. I recommend! Mir these looks SO yummy 😉 I am totally with ya, I get cranky on Sundays a lot of times too… Sunday’s and Monday’s are the hardest, because it means the week is coming and then the first day of the week is just ;-/ but these bars totally look like they can help anyone survive Monday YUMM-O! These could totally help with the Sunday night blahs! The chocolate peanut butter combo is the best! I hope your week gets off to a great start! Thanks for sharing a peanut butter recipe Mir, I really have to make something like that, probably next weekend! I kind of hate Sundays, too 🙂 Gluten free? So good, I’ve been experimenting with oat flour a lot and I like it! That’s great, Mira! I can’t wait to see what you make with your oat flour. I hate Sunday nights – they remind me of having school the next day. These sound so good. You had me at peanut butter! I think we’ll always feel that way. Something about going back to work/school, even if we like it! 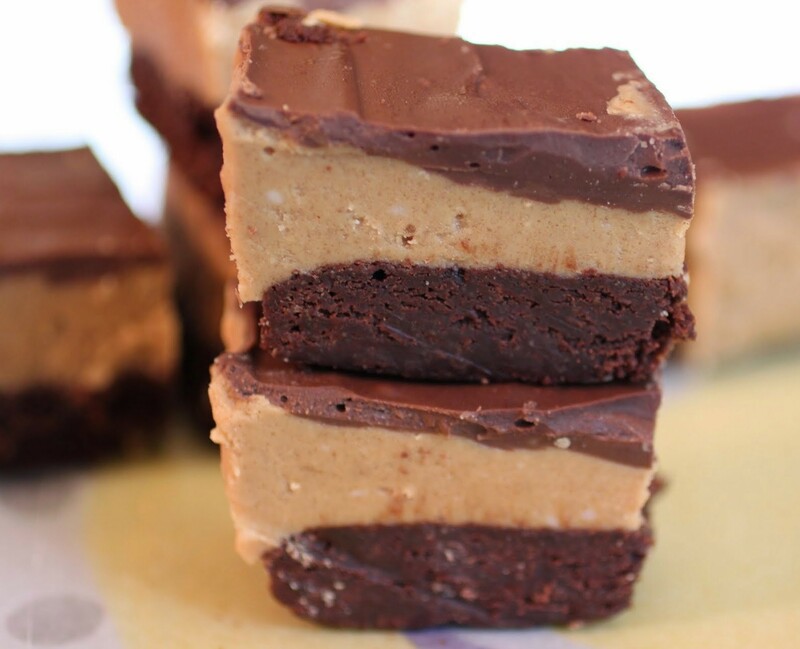 these look so delicious, brownie + peanut butter! Yes Please! I think chocolate and peanut butter can patch just about anything up, including the Sunday night/Monday morning blues. I didn’t have the day off from work today either, not fun but oh well! These look like a great way to get through Monday though. Love all of the peanut butter in these and that you used oat flour. Delicious! Thanks, Danielle! I was pretty bummed about everyone being off around me except me. Oh well indeed! Peanut butter and chocolate=heaven. These bars look incredible. . Yumm!! Thanks, Arpita! That combo is definitely my heaven! So sorry that you didn’t get Monday off, but I bet these bars took some of the sting away!! 😉 Wowza, do they look good!! They were kinda good, Jocelyn. And it helped! I was super jealous of all my friends, running around free. Oh well! These look so so good, I’d love to eat one right now! Thanks for linking up to Sweet and Savoury Sunday, stop by and link up again. Have a great day! !